We also provide a range of diagnostic services and have close links with other specialties such as allergy/immunology, thoracic surgery and oncology as well as national reference centres (Royal Brompton Hospital, St George’s Hospital, and Guy’s and St Thomas’ hospitals). All clinics are held at the locations below. Please check your appointment letter and make a note of which location your appointment is booked for. See St Helier Hospital and Queen Mary's Hospital for Children for information to help you plan your journey. See Epsom Hospital for information to help you plan your journey. 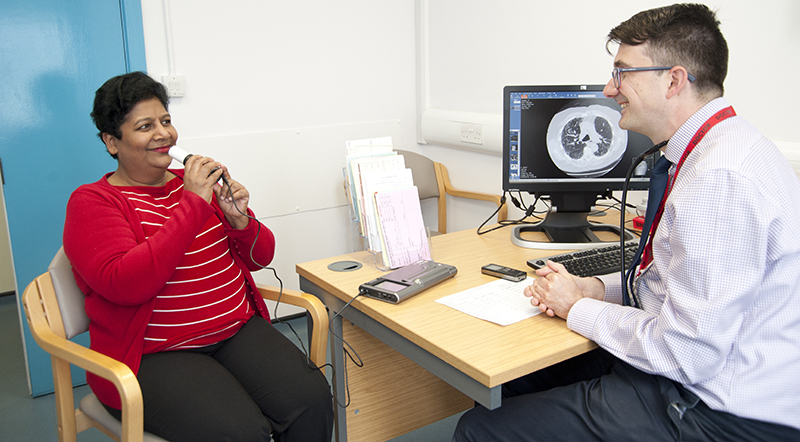 As a teaching hospital we have doctors who are undergoing their specialist training in respiratory medicine or general medicine, as well as medical student from St George's Medical School, University of London. Sometimes medical students may be present during your appointment. Please tell the doctor or nurse in charge if you do not wish for a student to be present. Your GP, practice nurses or hospital consultant can refer you to the service. GPs and other clinicans can read more about referring to our services or can contact the service using the details below.